A book is a great gift to give at Christmas – long-lasting, can be personalised, relatively inexpensive, easy to wrap, and wil always look as if you’ve thought hard about it, even when you haven’t! And if the worst comes to the worst it’s recyclable and re-giftable! I’ve posted recently about books for children, both fiction and non-fiction, but what about the grown-ups? Below, I’ve listed my stand-out reads of the year, any one of which would make a fantastic gift. Click on the title of each book to see my longer reviews. Would suit men or women of any age who just love a great story, brilliantly told. It’s about two young men, mercenaries in the American Civil War, one of whom is an Irish immigrant, who find love amidst the horror, carnage, poverty and degradation. It’s graphic and hard-hitting but also tender and moving. Shouldda won the Man Booker IMHO. For lovers of Yorkshire who like their fiction a bit dark. Shortlisted for the Man Booker but sadly did not win. Daniel lives with his father, a bare-knuckle fighter, and his sister Cathy in an isolated rural home they built themselves, life takes a very dramatic turn when they are threatened by the local landowner who bears a grudge against the family. For anyone interested in mental health issues. A fine first novel, which has rightly won many plaudits. Eleanor is our narrator, an unusual and vulnerable young woman who struggles to find her place in the world and conform to social norms. At times funny, at others heart-breaking, it’s a cracking read. A great book for strong women who would like to turn the gender tables! Winner of this years Bailey’s Women’s Prize for Fiction, it’s a brilliant satire on what it might be like if women ran the world. In this powerful commentary on gender politics, the world’s women find they have a physical ability to injure, kill and therefore control men with an electrical charge. Imaginative and original. For campaigners and humanitarians. Written by the widower of the late Jo Cox MP, brutally murdered in her Yorkshire constituency by a Far Right Extremist, this account of the woman and her values, not only gives an insight into the life of this extraordinary politician, but is also a reminder of what it is to be human. For anyone fascinated by the tussle between modernity and tradition or for lovers of Africa. Set in Nigeria in the 1980s, this novel is a story about Yejide and Akin, an infertile couple and the pressures that places on their relationship. Moving and brilliantly plotted. For natives of Essex or London or those who like a grown-up mystery story. Newly-widowed Cora Seaborne moves to a small Essex village with her autistic son, and strikes up a deep friendship with the local vicar, Will Ransome, over a mutual fascination with archaeology and in particular a local legend about a serpent who blights the lives of the inhabitants. It explores the conflict between science and religion, reason and superstition at the end of the 19th century, and the nature of love in all its forms. I’ve just realised that all of these books explore the many types of love. Perfect for this season! If you have enjoyed this post, please subscribe to my blog by clicking on the ‘Follow’ button and follow me on social media. So earlier in the week, I posted about the Man Booker 2017 shortlist and today I want to tell you about a prize winner, The Power by Naomi Alderman which won the Bailey’s Women’s Prize for Fiction in June. This year’s shortlist was a strong one, so it did well to come out on top. I’d also read Do Not Say We Have Nothing and Stay With Me from the shortlist; this latter book is wonderful and so I was expecting great things from The Power. I took it on holiday with me and read it in just a handful of sessions (my favourite way to read) and I’m afraid to say I was a little disappointed. For me, it was not better than Stay With Me. I’m not a huge fan of science fiction; my last foray into this genre was Station Eleven by Emily St John Mandel, which I think I probably enjoyed more than The Power if I’m honest. Because I’m not a big reader of this genre I find it quite difficult to review. I’m not sure what the norms and expectations are, so the things I might criticise or dislike are perhaps standard constructions in science fiction. For example, when reviewing a historical novel, we expect accuracy, realism, research. When reviewing a novel set in our own time we expect realism in the sense of standards that we recognise as possible. With science fiction, however, it irritates me that all normal conventions are suspended. Perhaps that why SF writers write in this genre, because they are free of those constraints, but to me it seems a bit lazy. I’ll give you an example: I enjoyed Station Eleven but I couldn’t get this nagging thought out of my brain that we were dealing with one small part of the United States, and I just couldn’t quite believe that the rest of the world had been similarly afflicted and could not make contact – pre-electricity societies managed to get around the globe fairly successfully! However, The Power is a prize-winner and seems to have been universally lauded, most notably by Margaret Atwood (Alderman’s literary mentor) whose ground-breaking novel The Handmaid’s Tale has just enjoyed a very successful television adaptation. The premise of The Power is a subversion of current social norms where men dominate, to one where women discover that they have a physical superiority, an ability to electrocute and disable, even kill, men. The novel begins (presumably in the current time) when women begin to discover they have this power and start to use it in ways that enable them to dominate. The story is told through the experiences of a number of women and a male. First there is Roxy, the young daughter of a London gangster who, once she discovers her power, undertakes a purge of all her male foes, her father’s enemies, and her half-brothers who threaten her, to become the top gangster in her field. Then there is Margot a small-time US politician who discovers she has the power and uses it, over a period of years to eliminate her political enemies and rise to great things. Initially, Margot has to hide her power; society is initially hostile to it, and therefore those who have it, seeing at as a threat which could upset order and stability (yes, much of the novel has to be read as a deep irony). Margot, as a politician is also connected with a number of corporations who would no longer support her if they knew she was a carrier of the power. Third, there is Allie, a teenager adopted into a right-wing southern American Christian family (more irony). She is abused by her adoptive father and in one of his assaults she electrocutes and kills him. She then escapes to a convent from where she morphs into Mother Eve, the head of the cult which spreads the power worldwide. One of the followers of the cult is Tatiana Moskolev, the estranged wife of the President of Moldova, who sets up her own republic in the north of the country and establishes a brutal regime where men are mere playthings, sexually abused and murdered at will. Finally, there is Tunde, a young Nigerian, who when we first meet him is trying to seduce a young woman, unsuccessfully as it turns out, because she gives him a small but still very humiliating electric shock when he makes his move on her. It is clear the power dynamic has shifted! Tunde senses that change is about to come to the world and so he sets about travelling the globe, posting his obervations on the internet and thereby becomes an international journalistic sensation. The story has a complicated structure, which at times I found difficult to follow. It is very much a satire, but not in the mode of Paul Beatty’s The Sellout, which won last year’s Man Booker Prize. There are parts of the book which are almost too brutal, too visceral, too emotionally raw for satire (maybe it’s me, maybe it’s the age we live in?). At 42 the author is not much younger than me, so I can’t say it’s a generational thing, although I note that among the many other strings to her bow she is a computer game designer. I wonder whether the kind of violence common in that medium means the author has a different perspective (taste?) for use of violence and physicality in art. It’s a clever book, the idea is fantastically original, subversive (women dominating men!) and mischievous. Alderman is also a very able writer, and it’s an impressive read. 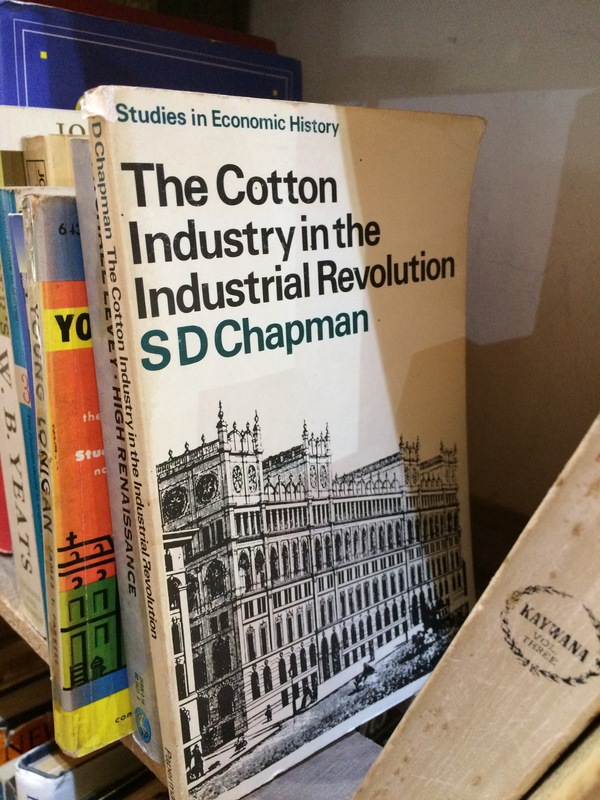 I did find the book a page-turner, but it fell off towards the end for me. It just got a bit…silly! But then I also accept that maybe it wasn’t supposed to be credible, and that is indeed the powerful central irony. It’s a good read, but I still preferred Stay With Me for the Bailey’s Prize! What did you think of The Power? I’d be interested in your perspective if you’re a regular reader of science fiction. If you have enjoyed this blog, I would love for you to like or follow me, and for us to connect on social media. 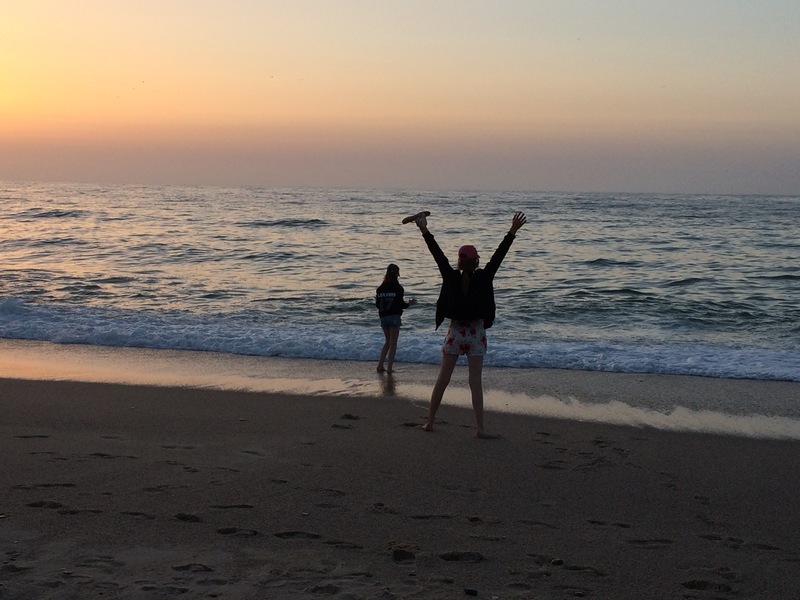 I’m on my holidays with the family in Portugal. It’s a lovely country: the people are warm and laid-back, the food is wonderful, it’s a seafood-lover’s paradise. 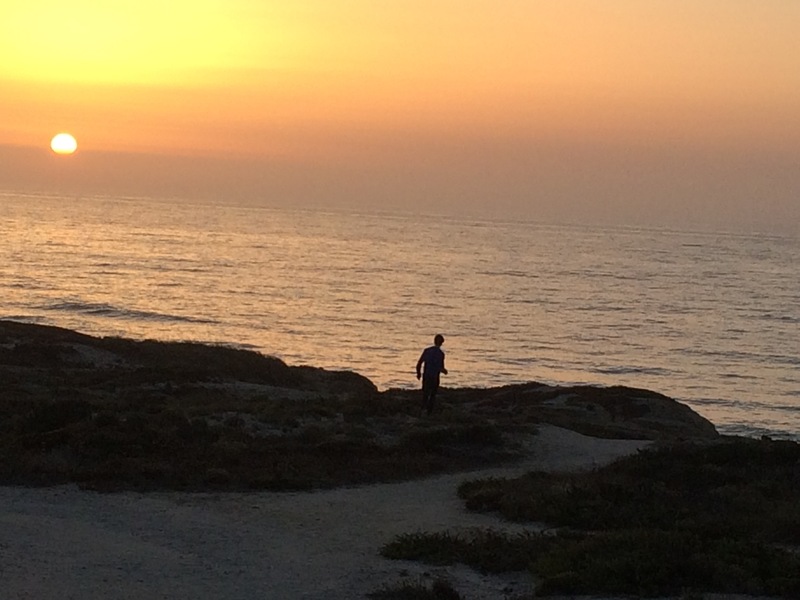 The weather where we are, north of Lisbon on what is known as the ‘Silver Coast’, is warm and sunny, with Atlantic breezes keeping the temperature below the more intense numbers you get on, say The Algarve – mid-30s Celsius is tough on a fair-skinned Brit! When you have to take your holidays in August (school!) you have to think carefully about where you go. It’s so much more expensive before you even arrive and popular locations can be jam-packed, unbearable with children. 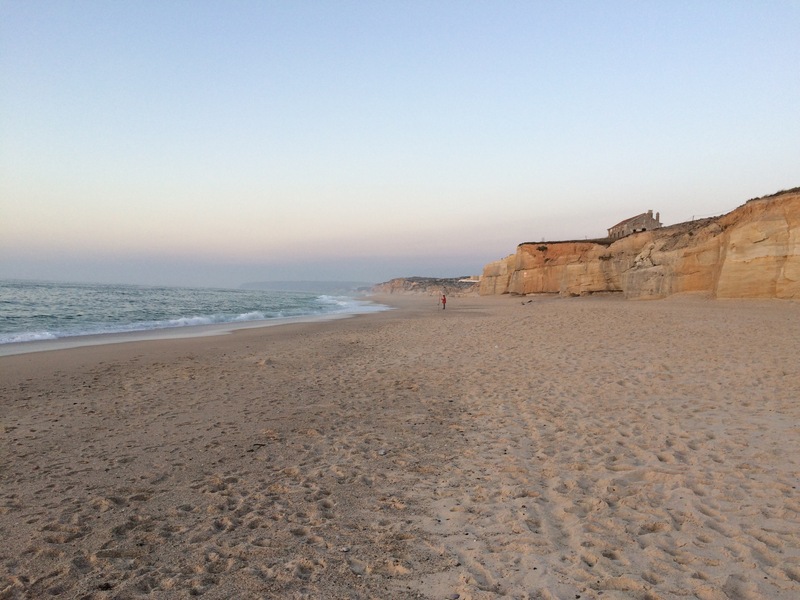 Our location here in Portugal feels perfect just now. The beach is stunning, vast and empty, and the ocean majestic, though cold even to paddle in for me and mostly too much undertow for swimming. 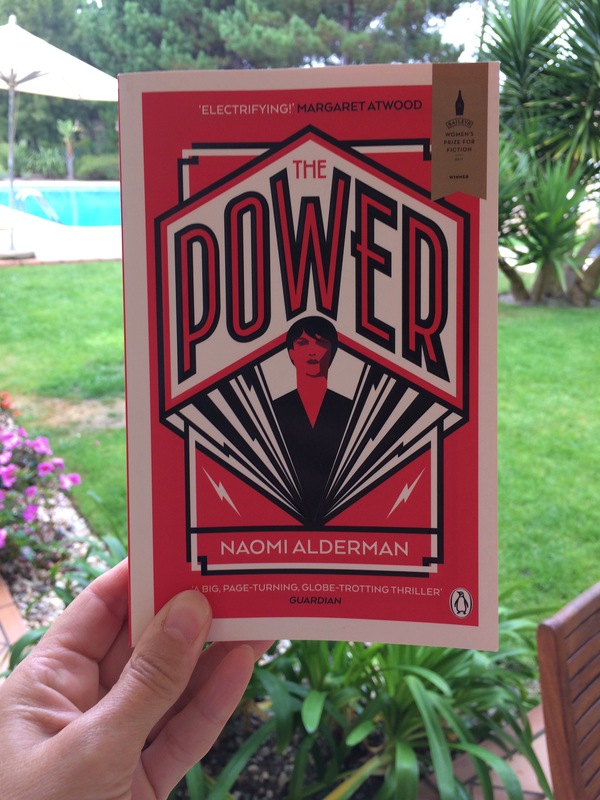 Since we arrived on Saturday I have finished reading The Power, the Bailey’s Prize-winning novel by Naomi Alderman. I wasn’t bowled over by it I’m afraid, but will post a review in a couple of weeks. 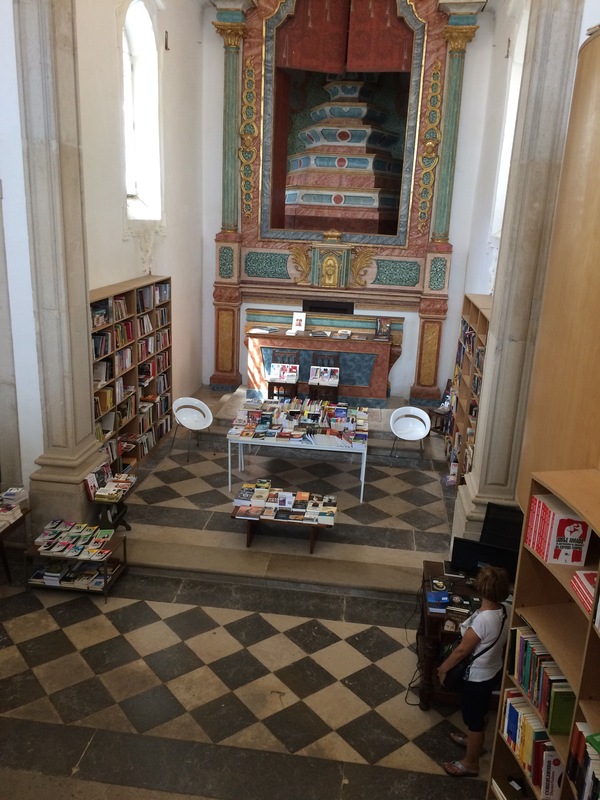 We are staying close to the beautiful town of Obidos, which has designated itself, rather fortuitously for me, ‘City of Literature’! 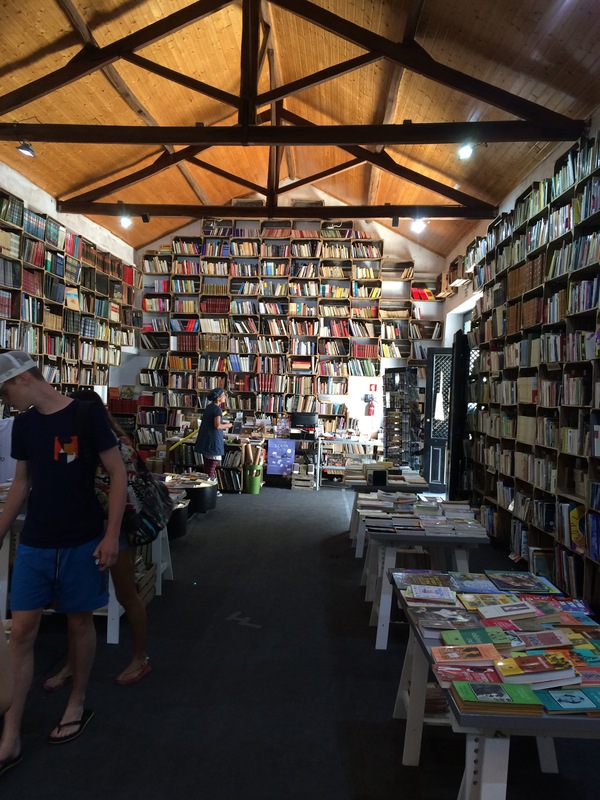 My book-seeking antennae were out and we found two amazing bookshops. Plenty of Manchester references here I expect! 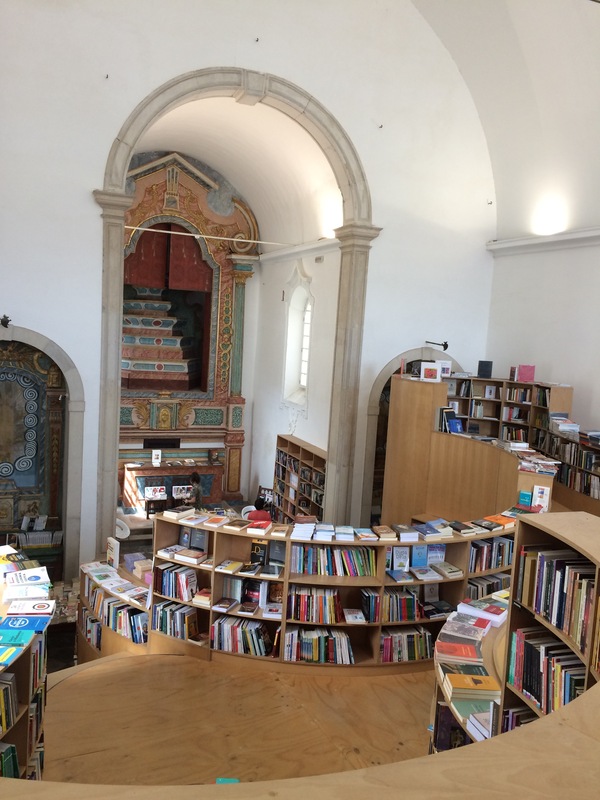 The next bookshop was in a converted church and had the most amazing structure of wooden shelving which doubled as stairs and a mezzanine. Reading-wise I’m currently enjoying Lisa McInnerney’s The Blood Miracles, which is so far matching the quality of her first novel The Glorious Heresies. I hope you are also enjoying the holiday season and that you’re getting plenty of R&R (reading and relaxation) in!